I just got my free credit score from Quizzle and it is 776. As you can see I actually got it on the 21st. Last time I reported it was back in 2011 and it was 779 and before that in 2010 it was 776. Interesting that its barely changed over a 3 year period. 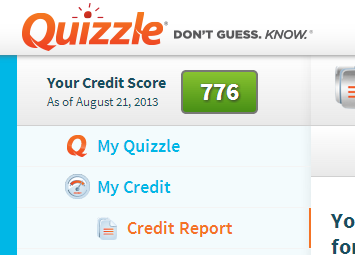 I suppose that makes sense since my credit usage really hasn't changed much. Here's my original post about Quizzle and how it works. Lately they seem to push financial services more and really seem to want to sell you refinancing or credit cards, etc. But thats easily ignored.